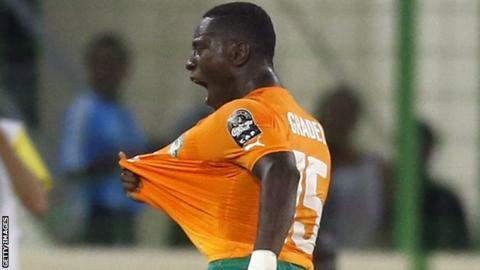 Ivory Coast beat Cameroon to earn a place in the Africa Cup of Nations quarter-finals as Group D winners. Max Gradel scored the goal that gave the Elephants the only victory in the six matches in the group, and saved them from having to draw lots. He smashed in a drive from 20 yards to set up a last eight match with Group C runners-up Algeria on Sunday. Edgar Salli missed two good chances to equalise, hesitating when clean through and also blazing over from in the box. Those glaring misses left Cameroon bottom of the group - their worst finish at a Nations Cup finals - and it also means lots will need to be drawn on Thursday to decide whether Mali or Guinea, who played out the fifth 1-1 stalemate of Group D, take the other quarter-final place. Ivory Coast will be relieved to have avoided that lottery, having gone out in 1988 by that method, as they did just enough to earn the win that guaranteed them passage to the knock-out stages for the sixth successive time. They had the better of the early exchanges, Serge Aurier crossing for Wilfried Bony, whose effort via his hip was pushed round the post by keeper Fabrice Ondoa, before right-back Aurier was himself denied as the Cameroon stopper dived low to keep out a header. But neither side was brimming with confidence and the first half-hour lacked fluency and decisiveness. It was a moment of uncertainty from Cameroon defender Jerome Guihoata that cost his side dear when he lost the ball to Gradel 25 yards out and the forward sent a rasping drive into the left corner to open the scoring. Cameroon had a chance to restore parity three minutes later, but Salli took too long to get his shot away when clean though and Sylvain Gbohouo rushed out to save with his legs. Salli was guilty of a worse miss when he blazed high and wide from the edge of the box with the last kick of the half - and it proved to be his final touch as he was replaced by Vincent Aboubakar at the start of the second period. It was a change that was destined not to work for Cameroon as Aboubakar could do no better than Salli, spurning his side's only clear second-half chance, scuffing a shot from eight yards out. Cameroon were simply unable to find a spark to ignite their play and in the end the Indomitable Lions limped out of the tournament. Ivory Coast will hope that Yaya Toure has not done the same, as the Manchester City midfielder looked to be carrying an injury when he was substituted on 82 minutes. Match ends, Cameroon 0, Côte d'Ivoire 1. Second Half ends, Cameroon 0, Côte d'Ivoire 1. Delay in match Serey Die (Côte d'Ivoire) because of an injury. Attempt missed. Vincent Aboubakar (Cameroon) right footed shot from outside the box is too high. Henri Bedimo (Cameroon) wins a free kick in the defensive half. Foul by Wilfried Bony (Côte d'Ivoire). Sylvain Gbohouo (Côte d'Ivoire) is shown the yellow card. Cheick Doukoure (Côte d'Ivoire) wins a free kick in the defensive half. Foul by Eric Choupo-Moting (Cameroon). Serey Die (Côte d'Ivoire) wins a free kick in the defensive half. Vincent Aboubakar (Cameroon) wins a free kick in the attacking half. Dangerous play by Wilfried Kanon (Côte d'Ivoire). Siaka Tiéné (Côte d'Ivoire) wins a free kick in the defensive half. Hand ball by Junior Tallo (Côte d'Ivoire). Attempt saved. Vincent Aboubakar (Cameroon) right footed shot from outside the box is saved in the top centre of the goal. Stéphane Mbia (Cameroon) wins a free kick in the attacking half. Aurélien Chedjou (Cameroon) wins a free kick in the attacking half. Foul by Cheick Doukoure (Côte d'Ivoire). Nicolas N'Koulou (Cameroon) wins a free kick in the defensive half. Foul by Serey Die (Côte d'Ivoire). Foul by Clinton N'Jie (Cameroon). Serge Aurier (Côte d'Ivoire) wins a free kick in the defensive half. Foul by Henri Bedimo (Cameroon). Wilfried Bony (Côte d'Ivoire) wins a free kick in the defensive half. Substitution, Côte d'Ivoire. Cheick Doukoure replaces Yaya Touré. Foul by Stéphane Mbia (Cameroon). Attempt blocked. Vincent Aboubakar (Cameroon) left footed shot from outside the box is blocked. Assisted by Eric Choupo-Moting. Attempt missed. Vincent Aboubakar (Cameroon) right footed shot from the centre of the box misses to the left. Assisted by Leonard Kweuke with a cross. Offside, Cameroon. Vincent Aboubakar tries a through ball, but Clinton N'Jie is caught offside. Kolo Touré (Côte d'Ivoire) wins a free kick in the defensive half.